Now the Dale Jarrett Racing Adventure will be giving mere mortals the opportunity to drive a stock NASCAR race car around the Las Vegas Motor Speedway in excess of 160 mph. Some people like to go fast and others would rather prove they have gone fast. 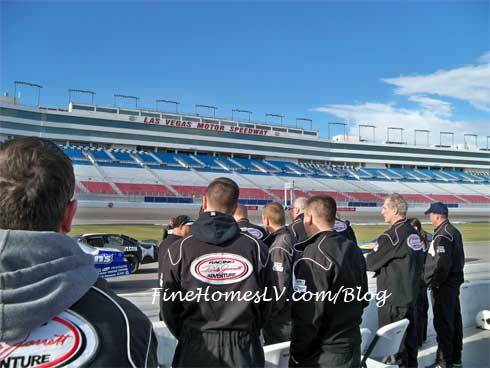 Everyone has the chance to do both at the same time during this Las Vegas racing adventure. Dale Jarrett started this racing adventure in the hopes of being different but better. This adventure pits you against your peers on the track. You actually get to learn to pass like the professionals. 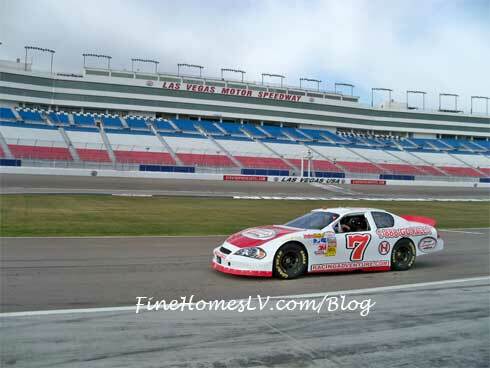 I recently went out to the Las Vegas Motor Speedway to check this out for myself and see if I too could go fast. On the first day of Dale Jarrett’s Racing Adventure, it was a full class. More than 40 of us loaded into the briefing room with a board, a mockup of the track that we all would be driving and several drivers. 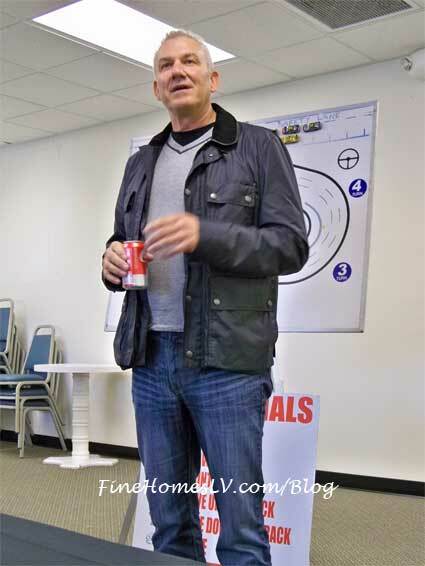 It was cool to meet Dale Jarrett, a former NASCAR racing champion and he addressed the class on the first day. His words of wisdom rang true about the third time around the track. You have to loosen your grip on the steering wheel in order to feel when to start turning for the four turns and keep your speed. The second instructor came up and talked about the different colored cones, hand signals they would be giving while going around the track and how to avoid having an accident with a fellow driver, while passing. The instructor also mentioned that even though the stock race cars are straight shift, we would only need to shift a few times to get onto the track and that we would be in fourth the rest of the way. Finally, he went over what it would feel like to have all of the safety equipment on. Before we left the training center, we received a good reminder. The people who signed up to get a DVD of their laps would also include what they are saying via strategically placed microphones, near the driver’s right shoulder. The class was super excited to get out to the track at this point. 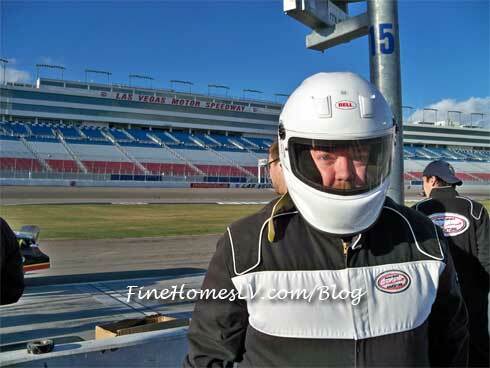 We walked out to the pits and put on fire suits and got fitted for helmets. Once we all checked out the gear and made sure things fit, we lined up and put our names on the callboard. There were four cars and they were in and out of the pit, to switch drivers. This helps with getting people on their way to experiencing 160+ miles per hour in a stock NASCAR race car! My first quarter lap got me comfortable with the apron of the track and near turn three, I moved over to the real deal. As soon as I ended up at the starting line again, an instructor passed me. Now the race was on! However, I now had to remember what to do when I passed the first cone and slightly slow down but also move towards the inside of turn one. Turn one at the Las Vegas Motor Speedway is super steep. Something I’ve never experienced before in a motor vehicle. My instructor assisted me with hand signals in order to navigate turns and straight-aways. One signal that the instructor kept giving me was to speed up. When does anyone give you that kind of signal when already going over 130 mph? !